The probe has proved good quality of measurement in studying hydraulic arameters of aqiufers (hydraulic conductivity and transmitivity). 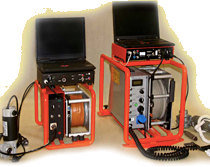 The sencor consists of a red LED as a source of monochromatic light and light-sensitive detector. The food colour Brilliant Blue, serial No. E133 is used as a tracer. That colour is on the EU list of allowed food colours, therefore the probe can be used in drinking water wells. Due to a high sensitivity of photometric detector, very low concentrations of the dye (in the range betw. 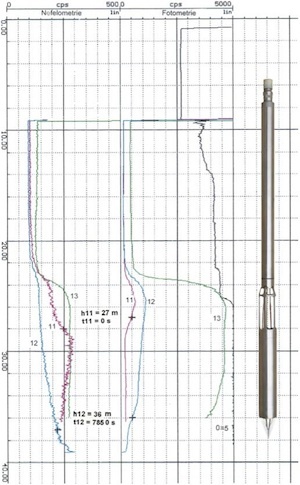 10 to 20 mg/l) can be used, and the probe can measure vely low vertical and/or horizontal groundwater flows. In contamination studies, the tracer has no interrerence with usually controlled and tested contaminants. The response of the probe is practically instantaneous (in order of seconds).